Suicide has become an increasingly serious issue in Goa, India, which palpably points to a larger problem of unaddressed mental health concerns and a multitude of misconceptions related to suicide. 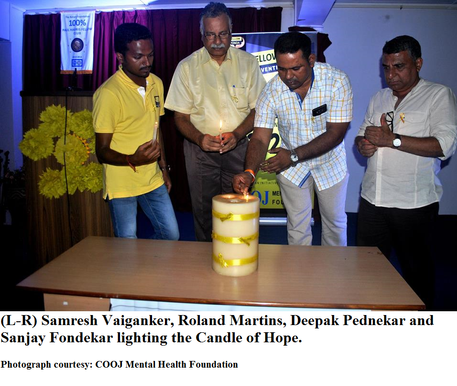 10th September, 2015, was World Suicide Prevention Day and was commemorated by the COOJ mental Health Foundation (www.cooj.co.in) in Ponda to highlight this insidious scourge. The programme had Kingfisher Voice of Goa 2014 (Hindi) singing a Konkani song from the movie Home Sweet Home to fit the occasion. 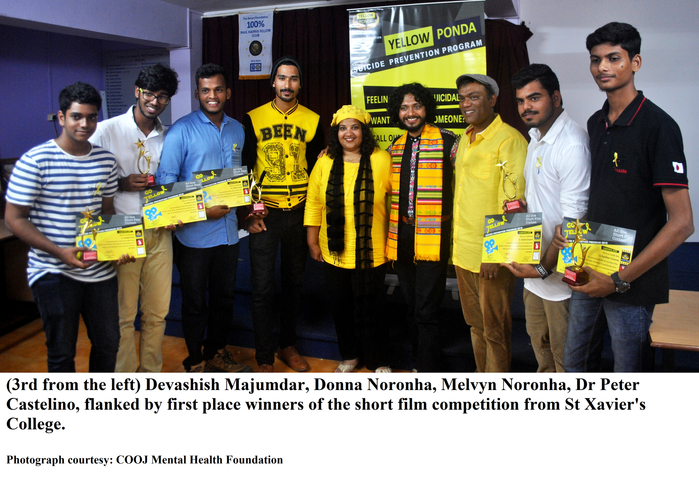 The prize winning entry of a short film competition on suicide from St Xavier’s College was entitled The Last Smile. The film was about how the timely support received saves a young boy from killing himself due to a broken relationship. Two other films, Fear Will Find You and Reaching Out and Saving Lives received a special mention. Fear Will Find You was particularly notable for its emphasis on seeking help, confronting ones fears and refusing to look to suicide as an option. COOJ has taken a number of steps to alleviate suicides in Ponda, where the occurrence rate seems to be unusually high compared with the rest of Goa. Dr Peter Castelino of COOJ drew the conclusion that this was because there were more cases reported in Ponda because the taluka has only one police station, whereas a taluka like Bardez has a number of police stations, therefore, information on death by suicide is not as consolidated. However, this conclusion was contested by activist and Rotary Club member Roland Martins who said, ‘The economic troubles in Ponda are causing these suicides. You find them more in the village area where the poor people reside rather than in the city centre. We have to look into the causes of the problem and provide solutions in terms of changing the economic situation and making the presence of a psychiatrist and counsellor compulsory in all government hospitals.’ Mr Martins pointed out the prejudice against helping migrant workers who commit suicide in high numbers due to paucity of jobs and feelings of isolation. He urged the people of Ponda to take up the baton of responsibility from COOJ and continue the good work and use the vernacular to ensure that the message is spread more effectively. 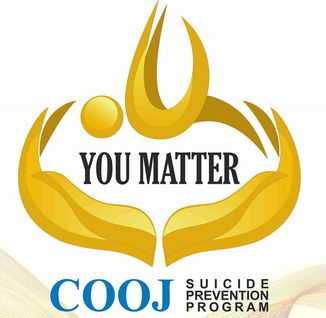 COOJ has done much to change the situation where the word suicide carried a stigma so great that it was never discussed. There was a street walk on 15th August from Kranti Maidan in Ponda. A gatekeeper workshop (a workshop held to create awareness and equip people with basic tools to handle potential victims of suicide) was held for police personnel, which saw over 125 policemen in attendance on 22nd August. Another gatekeeper workshop was held for journalists to sensitise them to the detrimental effects of sensationalising suicide deaths and providing explicit detail. Various other workshops have been organised with college students and there has even been a flash mob in the Panaji market on the 9th of September to create awareness. 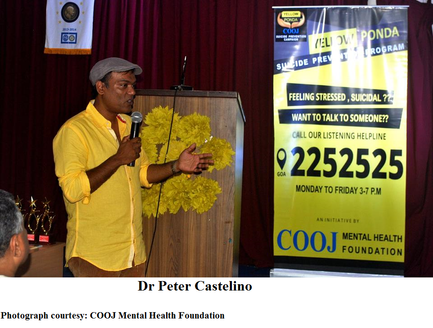 Dr Castelino explained the reason for using the colour yellow to symbolise suicide prevention. Mike Emme was a lively teenager who was ever willing to help others. Mike had a penchant for restoring old cars and one of these had been a Ford Mustang that he painted a bright yellow. Sadly, in despair he took his own life, which prompted his family and friends to create cards with yellow ribbons (inspired by the bright yellow Mustang) that said it is okay to ask for help when in trouble, and distribute them at his memorial service. From then on a legacy to save those tempted to commit suicide was established. The programme continued with distribution of certificates and awards to the participants of the short film competition. 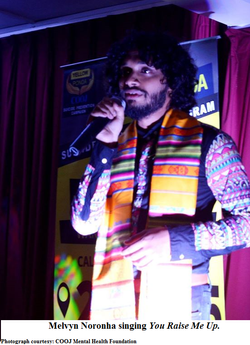 Well-known designer and Kingfisher Voice of Goa’s 2010 winner Melvyn Noronha soulfully sang You Raise Me Up and Devashish Majumdar rendered Give Me Some Sunshine from the soundtrack of the film 3 Idiots. The Candle of Hope was lit, with four wicks being emblematic of the grief experienced, strength and courage to face hurdles, memories and love. Small but sure steps have been taken to curb this problem of suicide and hopefully they will yield fruitful results in the future. Being preoccupied with death and dying. Withdrawal from friends and/or social activities. Having a recent severe loss (especially relationships) or threat of a significant loss. Experiencing significant changes in behaviour. Losing interest in hobbies, work, school, etc. Preparing for death by making out a will (unexpectedly) and final arrangements. Taking unnecessary risks, being reckless and impulsive. Losing interest in their personal appearance. Increasing the use of alcohol and drugs. Expressing a sense of hopelessness. Having a history of violence or hostility. Unwilling to connect with potential helpers. Inform the person’s nearest family members. Make them understand that their life is important. Be understanding towards them and don’t judge them. Keep all harmful items away from the person. Try and convince them to seek professional help. Keep in constant touch with the person. Help them get their life back together.